I just wanted to say a quick thank you. I'm at module 3 in the course and have been feeling quite overwhelmed by it all, some of the books i have been reading from the reading list, whilst being very interesting and opening my heart and mind to new ideas, have at times left me feeling inadequate and incapable of what I am learning. As an example I am reading meditation and mantras at the moment and had got myself completely over thinking meditation, sure that if I don't have a specific space in my house to meditate, exact time of day and length of time to do it I'm just setting myself up to fail, yesterday I was so sure I had got it all wrong having even signed up for the course in the first place I mean who was I kidding right? But today I watched your module 3 workshop videos and was reminded that we all have to start somewhere that really meditation is easy and can be done anywhere at anytime. Yes try to do it every day and be consistent but i dont have to have my own spot in the house that no one else ever goes into to be able to do it. I also did the 30 minute forgiveness meditation after the workshop, i have never meditated for more than around 15 mins and thought i would have no chance of going 30, also thinking this would leave me feeling the activity would be impossible. It was an amazing 30 minutes, I cried and felt about some things I didn't even realise I still cared about, I thought I had already forgiven and let go but this brought out more from me, and the 30 minutes flew by. I will admit I did this one laying down but I feel like meditation is within me, I felt tingling in my body a lightness and after it I felt great, exhausted but great. I am looking forward to trying the activity meditation now instead of apprehensive. Thank you, thank you for making the course relevant and accessible to everyone and for making people feel that being human is ok. It's been a while since I received this wonderful and kind email from you guys regarding my video assignment. I much appreciated all your kind words of encouragement and support. It really makes all the difference when you are entering a new chapter in your life. All through this course I felt completely supported and I think you can all be proud of what you are offering the world through your courses. I sure will be back for further studies. I am excited about the future and I thank you from the bottom of my heart for allowing me to go on this journey of self discovery. What a blessing. My hope is to carry this message on to my community and share my knowledge, so that others might find some peace, love and self acceptance. When I finished my course I was fortunate enough to go traveling with my daughter (5yo) for a couple of month and we had the best bonding time. I was seeing things very differently and we truly got to live in the moment together every day. Upon returning I have now opened my own little yoga studio in Adelaide and I am ready to serve others as I have always wanted to. I feel so incredibly grateful and all of you at MHY are part of my journey. Much love to you all and keep doing what you are doing...it makes a difference!!!! Thanks you all for such an amazing journey. I have really enjoyed each and everyone of the modules and have been able to incorporate many of the insights, wisdom and strategies into my personal and work life. Thankyou sooo much for your humbling feedback . I must say it brought a few tears as I realised I have found a philosophy, a passion ,a purpose ,true meaning and now look forward to every day as I continue to grow. The self critic in me had some doubts but yesterday I taught a class as a qualified yoga teacher at work to mental health patients ranging from 77yrs to 25 yrs and was able to adjust it accordingly. Everyone left calm and relaxed . Its so fulfilling to be able share this philosophy . Thankyou so much for giving me this opportunity . I a very grateful for the love and attention that you have put in to the education of all of the trainees that go through your school. It has been a beautiful experience that I will be grateful and blessed to remember through my life. Blessings of Love and Light to everyone at the My Health Yoga family. Thank you so much Carrie and Carlos. I am very excited and I have really enjoyed the course and learnt so much. Best wishes and have a fantastic day. Rather than forcing the completion and being critical of the result, today is different. My usual pattern is to overwork which I have done for most of my life and I catch myself frequently as I enter a new phase of growth. My numerous heart and emotional breakthrough's these past few months have caused such personal power, insight and change with myself, my relationships, my choices, what I value...The greatest learning has been my acceptance that it is ok to be me. So, today is just a simple of example of resisting the urge to do what I have always done. I have taken a break from working "fulltime" these past months, so that I can create the space to grow and heal and play and nourish. Rather than pushing through and overthinking, I am resting in sunshine. So I wanted to let you know that your feedback and insights are welcome as I grow and continue to learn about myself. My breakthroughs and relationship with myself continue to evolve. My small community of students, although few can be guaranteed wisdom, kindness and a safe place. You both are such wonderful souls for all that you do, and all that you are. As my mentors, friends and teachers you have created such a safe learning space for a 45 year old something like me to flourish. I can't thankyou enough for giving me the tools to open my heart. I just wanted to touch base & to let you know that I am so glad I have chosen to take on the Healers course with you and the rest of the My Health Yoga mob. On a personal level, I have found great comfort and healing and a deeper understanding of myself at a soul level. I am a Breast Cancer survivor. Not long after losing my Dad, my marriage broke down. A year later, I entered into a new relationship and lost a child and was told I had BC. I have done a lot of soul searching over the years and yoga and my previous study has helped tremendously. Your teaching has taught me to really fill my own cup and to not apologise for who I am. I am so glad that I have you as a guide on this beautiful journey of life. I feel loved, safe and nurtured. Many blessings to you all. "Carrie I can feel your authenticity through the screen 🙂 you know what you are talking about and that is obvious. This is what I was looking for - to be inspired and taught by people 'walking the walk'." I have started the course. Thank you for this amazing opportunity . The web content is very straight forward and easy to understand. I am very pleased with my decision"
Firstly I just wanted to let you know just how much I love the online yoga videos provided with the online teacher training course. The posture and alignment queues are very thorough and make me feel as if I’m at an actual class (actually, they are probably much better than some of the classes I have been too!). I also love how you mention the impact on the meridians of the body, which no other yoga instructor has discussed before that I have heard. This resonates with me particularly due to my massage background with a particular interest in acupressure and TCM. I’m really happy with the course so far." I am about halfway through my online teacher training and I wanted to share how awakened I feel from this experience so far and to just sincerely thank you for guiding me onto this beautiful path. People close to me have even been commenting on how radiant and happy I am lately, and it is because of the knowledge and awareness I have gained through you." Just completed the Alignment Workshop…. LOVED IT!!! You are both wonderful teachers J I am blessed to be trained by you. I loved the outtakes 😉 …. Brilliant end to the video! Thank you for your excellent advice, course notes and just all round loveliness!!! Im currently taking your on line level 1 teacher training & i just wanted to say thankyou, i am learning so much & am so filled with love & gratitude for this experience my life is changing & unfolding in ways i never imagined, Thankyou to all at My Health Yoga have a beautiful day. "I am on such an amazing journey at the moment, I am just amazed. Just loving every minute (a little nerve-wracking at times, but cannot be happier). I am currently taking a class of ladies who have scoliosis and I am getting such positive feedback from them, so awesome! I just want to thank you guys for the unbelievable knowledge and encouragement you have given. This has been such a HUGE step of personal growth for me and it trickles down to my students and family. Thanks a lot for guiding me through the whole course, i have learnt a lot from this course, and really appreciate that, once again, universe has chosen the best for me! Here is a bit sharing about my learning. when I write my assignments, I never feel like it's a assignment, it's more like a self reflection to me for my past. All these vedios and assignment give me deeper and refreshed understanding about my life experience and lessons. That's why I enjoy the couse so much. During my training, I experice few turbulences. And your blog light a light for me, to learn truly trust universe plan and myself, to learn true surrender and acceptance. Today i still read your blog now and then, try to find the wisdom from words and sentences. I just wanted to say how impressed I am so far with the course content and structure. It's really reassuring that something online for something so physical can feel so thorough. I'm really enjoying your classes as well Carrie - thank you." "I have started my Online Learning for Yoga Level 1 in the past few days and have briefly looked over everything I just have to say you, it is AMAZING. I cannot believe how thorough the course is and how you have gone into depth with the metaphysical benefits as well, I am so excited and this course is fantastic! In love already! Thank you thank you !!" I just wanted to let you know I taught my first official class last night and it was great!!! Everyone came up after class and gave me a hug and thanked me, it felt pretty special! So much gratitude for you and all I've learnt so far, thank you both. "I just wanted to say a huge thank you to Carrie and Carlos…I'm well into exploring Module 1 and I'm astonished and oh, so thankful for the amazing range of resources and supports you have included in the course. Videos, workbooks, tests, online classes…so many things that are really, really helpful. Huge appreciation to you both - it must have been a mammoth process putting everything together in such an accessible and thorough way. "When I first started this course I know I was beginning a journey. I thought that this journey would be a voyage out into the Universe, and that the destination would be far away, beyond anything that I could imagine. I thought that my final summary of the course, my journey and the past year would provide some profound insight and revelations into greater consciousness and the complexities of the Universe around me. I thought that I would finally understand what is out there....What I did not realise was that the journey would simply bring me back to myself." "I was so glad to meet you the other week, your presence and being is really truly beautiful and I was discussing with the other students how if felt nice just being around you. I was buzzing for days after." "The past two and a half years as a yoga teacher have been the most profound, positive and loving experience of my life. I wanted to thank you for taking me through the teacher training and to let you know that the journey has been very successful for both myself as a teacher, yoga practitioner and as a human being but also in terms of genuinely helping others. Your training and your energy has played a fundamental part in this beautiful experience. I am truly grateful to you." "Thank you Carrie, your caring, kind heart it's appreciated by us all who attend your classes and teacher training. I know "life changing " can be used frequently , but I feel it has been for me,in the way I feel about me, my relationship with my son and the relationships I have every day with friends and family." I’ve reached the end of my course now, just coming back from retreat this weekend. From the retreat I don’t think I’ve ever felt this close to the universe! I seriously feel more enlightened from this experience. I’m really starting to truly experience unconditional love fore everyone, everything, life, the souls I am able to connect with. A mantra/affirmation came to my intuition last night throughout universe time. “Life is such an amazing experience for my soul, I love you.” Really expressing my love to God/The Universe for exposing my soul to the human experience through life. I’m so grateful to be in a human form living a life, I feel like my soul is becoming more enlightened from this experience. 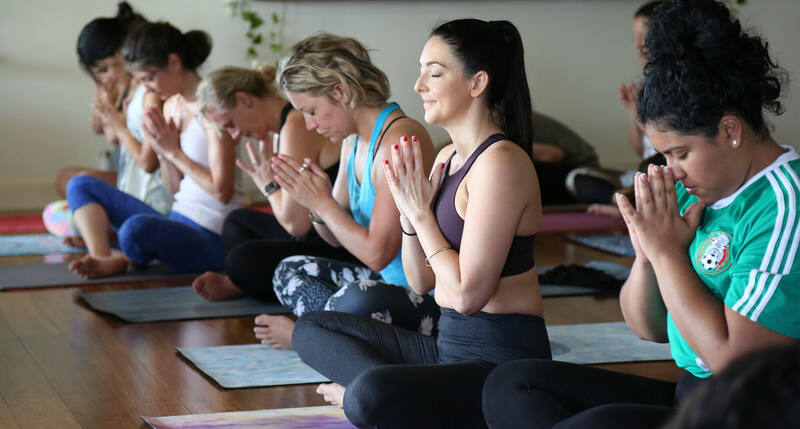 This entire yoga teacher training experience has helped me experience a greater sense of unconditional love for every soul and everything, and allowing my soul to progress on this journey of enlightenment. Honestly, I don’t even know how else to describe what I am experiencing right now, words cannot justify these extraordinary emotions I am feeling, and will experience for the rest of my life. "I would like to take this opportunity to thankyou Carrie-Anne and all the guest teachers for dedicating your time and sharing your wisdom. You are all an inspiration. I recommend and encourage the Yoga teacher training course not only to those who wish to teach but also to those who are in search of their spiritual path. I feel enlightened and inspired having been surrounded by so many like-minded people. The transfer of energies and the feelings that I encountered during each class will remain fond memories forever."